Our experienced technicians service all KRGS Roller Shutters, Roller Grilles and Folding Doors as well as those of most other brands, dependent on availability of parts. The founders of KRGS bring together more than 56 years of experience in the door industry. 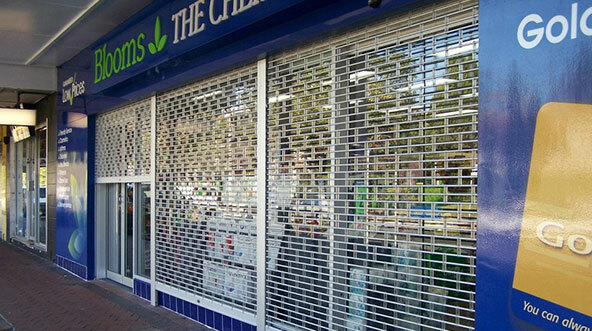 We provide an extensive, diverse range of high quality Roller Grilles, Shutters and Folding Closure products suitable for retail, commercial and industrial applications. We manufacture right here in Sydney and not only supply and install, but also provide after-sales service which includes 24-hour emergency shop roller door repairs, as well as regular maintenance and upkeep support. With solid knowledge and practise in the industry, we help you stay on top of your security issues, so you can get on with your business, knowing we’ve got your back! When the unexpected occurs, it often doesn’t just happen between 9 and 5 on a Monday to Friday.Sometimes you need reliable service or repairs outside of normal business hours. We understand this and can work in with you to meet your needs and ensure our mutual goal is achieved. We offer a 24-hour roller door service, including emergency repairs. All our products are manufactured locally, right here in Sydney, so our turnaround time cannot be matched, and our friendly and expert staff is experienced in doing what is needed – efficiently, effectively and reliably, every time. We have a genuine passion for our industry and it shows itself in the quality of our products, staff and services.We constantly strive to be the best, continually looking at smart ways to do things differently and more cost effectively, so we can pass on these advantages to our customers. As the saying goes, “to be number one you have to work like you are number two”. At KRGS we take pride in what we do and how we do it. Our passion is to serve our customers the best ways we can – with manufacture and supply, as well as regular and emergency roller door repairs, parts and servicing. Our reputation rests firmly on the quality of personalised attention we provide.We strive to maintain and improve our high standards at all times. As a proud, locally-owned, Australian company, operating and manufacturing from right here at our Sydney premises, we care deeply about the excellence of the goods and services we have to offer. Access to reliable commercial roller door repairs and service is an essential part of your business security and, unlike large franchised operations in other industries, we are committed to personalised service that attends to each of our customer’s individual needs. Consult us when you’re in the market for commercial or shop roller doors, shutters and security grilles, or are in need of roller door repairs or service in Sydney. Some Doors can be repaired without a call out, check out our FAQ page above for simple trouble shooting answers that may help you with your door. Like all mechanical items, with a little care and attention, your KRGS Roller Shutter or Folding Closure will keep performing long into the future. We recommend that your door is serviced by a Qualified KRGS Doors service technician every 6 months. KRGS Doors has qualified service technicians on-hand to service or repair your new or existing roller shutter, roller grille or folding closure. Whether you need repairs and replacement parts for your KRGS door, we can help. Our experienced technicians service all KRGS Roller Shutters, Roller Grilles and Folding Doors as well as those of most other brands, dependent on availability of parts. Thanks to our superior and personalised shutter door repairs domestic, commercial, and retail customer can ensure that their property is free from intrusion. KRGS offers 24-hour roller door repairs for those times when urgent, emergency roller door repairs are needed for commercial and shop requirements. If storm damage, destructive acts or accidents strike, we are here at the ready with reliable, around-the-clock shutter door repairs to ensure you and your business experience as little disruption and down-time as possible. We pride ourselves on our expert commercial roller door repairs and service – both in emergency situations and for regular scheduled maintenance. Getting emergency commercial door repair in Sydney and other major Australian cities is easy – call now! Please complete the application form below and we will be in contact immediately. Our customers enjoy the comfort and security of knowing they have good, strong back-up for their commercial and shop roller door repairs when it matters the most. Our service and support has proved itself over many years to be reliable and of good value. With our roller doors being manufactured right here in Sydney, KRGS’ products and services are readily accessible to our local clientele, without lengthy time delays. We are devoted to providing excellent customer service and security products at highly competitive rates. At KRGS Doors we know the importance of keeping your commercial door in the best condition possible. Our thorough and personalised commercial door repair helps to keep businesses and retail properties secure from unwanted intrusion. Whether you want to set up security grilles and commercial roller doors for a protective security barrier to keep out trespassers, vandals and burglars, or you are seeking to upgrade and streamline existing systems, KRGS can assist and advise on custom-made solutions for your enterprises. If your security has been breached and you require shutter door repairs, we are the team to call for such emergencies as well. For commercial firms that need to maintain a high level of security, KRGS’s commercial security shutters also come with custom options that allow you to retain excellent visibility and airflow where required. KRGS is proud to be an Australian-owned company that has security shutters and other security products placed in such prominent businesses as Centro, GPT centres, Stockland Malls and Westfield Shopping Centres. Manufacturing our range out of Sydney, we’re proud to provide local and national commercial door repairs. Sydney, and wider Australian customers, call today for trouble-shooting support or any other needed assistance. At KRGS Doors we strive to provide the highest levels of service and customer satisfaction to all of our valued customers. With our flawless and methodical roller shutter door repairs Sydney locals across the city can secure their property when they go home of a night. By offering Sydney residents a modern and thorough roller door service and roller shutter repairs KRGS Doors can increase your peace of mind and sense of security for an affordable price. We use high quality materials and adhere to the strictest standards of manufacture and installation, supplying industry-leading security shutters and security grilles and door products for commercial establishments. We are also the most prompt and reliable team when it comes to emergency shutter door repairs. Give us a call on 1800 897 822 for friendly, expert service and advice. Imagine the risk posed to your business if you failed to adequately secure it. As a business owner, you undoubtedly have put in a great deal of time to keep your company going, especially in the beginning. It would be a shame to lose all your inventory and cash on hand because criminals found it easy to gain entrance to your premises. Not only will you suffer, but so will your employees, who count on working in a stable environment. What’s more, your customers, who depend upon you to provide valuable goods or services, will be left in a lurch after your facility has been burglarized. KRGS Doors is proud to provide a wide variety of high-quality security doors for use in commercial, retail and industrial settings, including clear glide bifolding doors, ClearVision shutters, folding closures, roller shutters, security grilles and counterweight doors. Our team of professionally trained experts will be happy to consult with you to determine the door or grille that would best meet your establishment’s security requirements. For example, you might need a grille with wide links that offer your business excellent protection while still providing sufficient visibility for customers to see what goods you have on offer. Many companies prefer such security grilles because they also provide great airflow.